We all need something to live for. That goes double for those of us thrust into a zombie-filled post-apocalypse, like The Evil Within’s Detective Sebastian “Seb” Castellanos. He needs more than most, as his particular apocalypse is uniquely grueling, ugly, and unfair. So what is that reason? Is there any moment Seb should not envy the dead? This is a question the game struggles to answer. It starts with Seb, rough and grizzled, answering a call to check out a crime scene at Beacon Mental Hospital. Flanked by his partners Joseph and Kidman, he finds a massacre: blood and bodies everywhere, viscera on the walls. With the police radio out, Seb makes the inscrutable decision to enter the mass murder site with just his small team. As expected, this does not go well. His team is attacked, Seb is knocked out, and when he wakes up he is hanging from the ceiling by his ankles, and a roly-poly hobo in a dog collar is butchering humans in the next room. He takes this, and everything that subsequently happens to him, surprisingly well. Getting out of this grisly den introduces a carefully wrought system of action well matched to Seb’s horrifying predicament. This isn’t a game that’s meant to be easy, so every movement has negative consequences that must be compensated for. The guns are standard for this type of game. They come flavored in pistol, shotgun, and sniper rifle, are often loud, and use scarce ammo. The Agony Crossbow, however, is quiet, powerful, and handles a variety of novelty ammo that freezes, shocks, or explodes, and is great if players can find the huge amount of time necessary to line up a shot. Even walking around is slow and unwieldy, as exemplified by an early, overlong scene where Seb has to limp his way around the aforementioned flabby butcher—who the game generously dubs “The Sadist”—he met earlier. When hiding is the best defense, our large, hapless detective will often peek his extremities out of cover if he’s not careful. Throwing a bottle can cause a distraction, but Seb’s exaggerated overhand is more likely to get noticed than the noise. All of this is by design, and lends palpable tension to the action. So the death traps can be arbitrary. It doesn’t help that the game also poorly explains how they function, making this an exercise in learning by dying. Take the game’s third chapter, which is an otherwise entertaining take on escaping a zombie village. The first two chapters emphasize stealth above all, so by the third chapter it’s clear that sneaking past enemies is the best way to live. Do this in the village, and players will run up against a locked gate that can only be opened after a run-in with a chainsaw-wielding giant. When this fight is started, every zombie that was avoided descends upon Seb like a plague. The lesson here, that everyone should be taken out before the only necessary fight, runs contrary to the previous lessons and is taught via Seb being lopped to pieces. 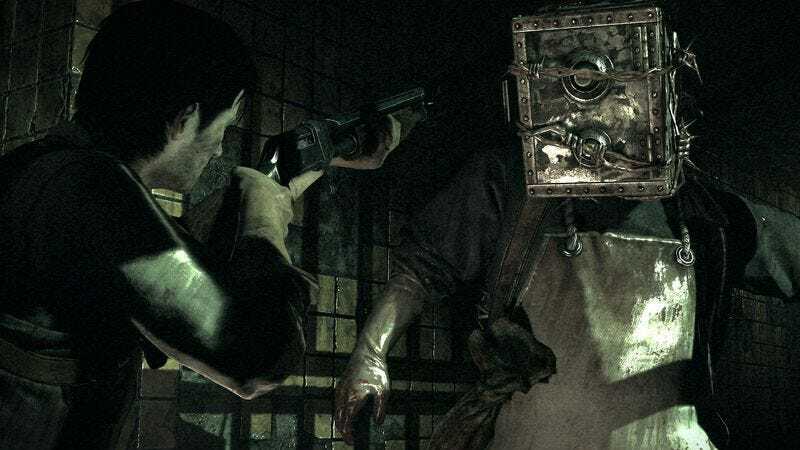 Horror games are a gory lot, and The Evil Within doesn’t disappoint in this regard, with Seb starting at a human deli tray and wading through pools of blood in short order. This is a game that never wastes an opportunity to present an intestine and has a focused story of many a throbbing brain. Initially overwhelming, it’s not an aesthetic the game sticks with, bouncing from this to a displeasing hodgepodge of boilerplate horror sets, like gothic ruins mixed with decaying contemporary hospital. Eventually it gets so far from its initial setting that it brings players to a brightly colored ruined city containing what are effectively knife-fighting Roombas. It’s hard to tell if this is the best or worst part of The Evil Within, because everything up to these last, strange points is so exhausting. The darkness of the world is suffocating, and after watching Seb die over and over again I wondered why he, or I, should bother. That the game begins to toy with whether or not its bleak world is real or a symptom of encroaching madness makes hope seem even more distant—on the one hand, this dead world is unending. But on the other, how is madness cured with violence? I wondered if Seb had anything waiting for him on the other side, but his past, which is delivered primarily through a series of short notebook entries, seemed somehow worse than his present. Should I keep playing, then, through the ludicrously long gauntlets of seemingly invincible boss monsters, constant deaths, and unbearable load times? Why? The game does allow for Seb’s abilities to slowly increase, and it does let that same character play through the game a second, much easier time. There is a kind of pleasure in putting down a past tormenter, if that’s enough. Certainly it’s not worth putting in the effort just for this woodenly acted, barely-developed detective. The Evil Within eventually gives Seb a reason to soldier on, far too late into the story. At that point, he’s the only one it helps.